Located on the Las Vegas Strip, next to its sister property, The Venetian Las Vegas, the $1.9 billion, 50-story Palazzo Las Vegas literally takes luxury to new heights. With over 3,066 expansive suites, luxury shopping and world-class dining and entertainment, The Palazzo Las Vegas opened in December 2007 under the direction of Sheldon G. Adelson, Chairman of the Board of Las Vegas Sands Corp.
Highlighted by a flagship, 85,000-square-foot Barneys New York, The Shoppes at The Palazzo features more than 60 luxury boutiques. In addition, 20 remarkable stores and luxury brands made their Las Vegas debuts at The Palazzo, including Chloe, Tory Burch, Christian Louboutin, Diane Von Furstenberg, Van Cleef & Arpels, Catherine Malandrino, Anya Hindmarch and Michael Kors. The Palazzo is also home to a variety of cuisines from a collection of award-winning chefs such as CarneVino by Mario Batali, CUT by Wolfgang Puck, Table 10 by Emeril Lagasse and Restaurant Charlie and Bar Charlie by Charlie Trotter. Other one-of-kind offerings include, Tony Award winning Broadway musical, JERSEY BOYS, the world’s largest Canyon Ranch SpaClub and the Strip’s first Lamborghini dealership. 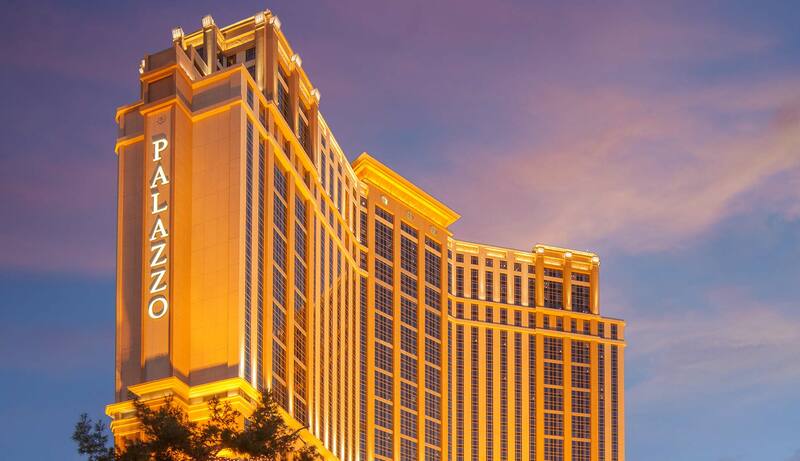 With our partner rates, you can save up to 50% off retail rates for Palazzo Las Vegas! Complete the form below and we'll send you a free Palazzo Las Vegas quote on your next trip to Las Vegas - no golf required!